NOTE TO VISTA USERS: For me, the mouse cursors do not persist between turning the computer off and back on again. It may just be my computer, but if this happens to you, copy the cursors to "(your drive letter here, usually C: )\Windows\Cursors" and you should be fine. These cursors should work fine with Windows XP, Vista, or 7. Unfortunately, I don't have a program for creating cursors for Mac or Linux. If you know of such a program and want to make Mac or Linux cursors out of these, let me know and I'll post the original .png images. Cursors created with RealWorld Cursor Editor. A very special thanks toward them! *As far as we know. 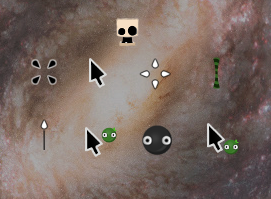 We haven't really told them about these mouse cursors yet, but we're sure they'll like them. I DO think they are good, I was just ASKING. P.S....HOW DO I OPEN THESE THINGYS!!! Yes, I have. There was a forum topic about it once. (Dig around a bit and you'll find it). I tried to make a WOG-like cursor for Windows myself, (and so did Enchanter's dad), but both of us failed. This is about as close as you can come with a Windows cursor (cursor "breathes," and you can set in Windows to have a cursor trail) to the WOG cursor, without having it round (I also tried a round cursor, but it didn't look very good). It'd be fairly simple to make a program that HAD a similar-to-WOG cursor in it, but to make Windows have a WOG-like cursor... either really really hard or impossible. Edit: if you read the comments in the link you posted, the guy who made the WOG-like cursor there said it was impossible to have a WOG cursor in Windows, too. Sorry. @James: I found that one too. I couldn't compile the source, though. I have the wrong version of Visual Studio. I'll try with other compilers, and hopefully finish the cursor that everyone has wanted for so long. Well, that would sure be cool! Good luck! In Windows 7, it automatically copies them to C:/WINDOWS/Cursors when you use them! It's a lot nicer than doing it manually on Windows Vista. Edit: I recently used Photoshop and moused over one of the disabled buttons, and it was really funny when the arrow suddenly changed to a Skull Goo that looked like it was talking! These cursors are so cool! This is cool! The first time that I can finally use an animated cursor for normal selection!